The US is unquestionably the world’s leading study destination. Yes, its market share has eroded as competing destinations, both new and established, have stepped up their own recruitment efforts. And yes the composition of the international enrolment base in the US has shifted in recent years toward a greater proportion of undergraduate students relative to those in graduate programmes. Even so, America’s pool of foreign students grew by 73% over the last decade alone, and data from the Institute of International Education indicates the fastest year-over-year growth for the US in 35 years from 2013/14 to 2014/15. As we noted earlier this year, however, that enrolment is heavily concentrated in that nearly six in ten foreign students in the US come from only four countries: China (which accounts for about a third all by itself), India, South Korea, and Saudi Arabia. The Saudi market has been badly disrupted this year by significant changes in scholarship policy, which in turn have been driven by the collapse in world oil prices that have affected so many commodity-based economies over the past year. Indeed, the shifting fortunes and challenging economic conditions in a number of important sending markets have placed a renewed emphasis on affordability for many students and families. This points to a key aspect of America’s competitive position in international education markets: affordability. Global studies typically place the US among the world’s most-expensive study destinations, and new surveys over the past year again highlight the issue of affordability for students considering study in the US, with some important implications for educators or agents recruiting for US institutions. For example, a 2015 study from Ruffalo Noel Levitz – 2015 E-Expectations Trend Report: How to Engage International Undergraduate and Graduate Students in the Admissions Process – found that the cost of study abroad was the number one concern for international students. “Financial requirements” was cited as the most prominent concern for nearly eight in ten respondents, both undergraduate and graduate students. The E-Expectations report also highlights international students’ tendency to apply to multiple colleges or universities, with nearly half of respondents indicating their intention to apply to three-to-five institutions, and with roughly a quarter planning to apply to six or more. That broad distribution of admissions activity highlights, among other things, a tendency towards active comparison of study options and costs, even at that relatively advanced stage of the enrolment funnel. Another recent survey from Eduventures takes the point further still by highlighting affordability as the main barrier in preventing admitted international students from following through on their studies. 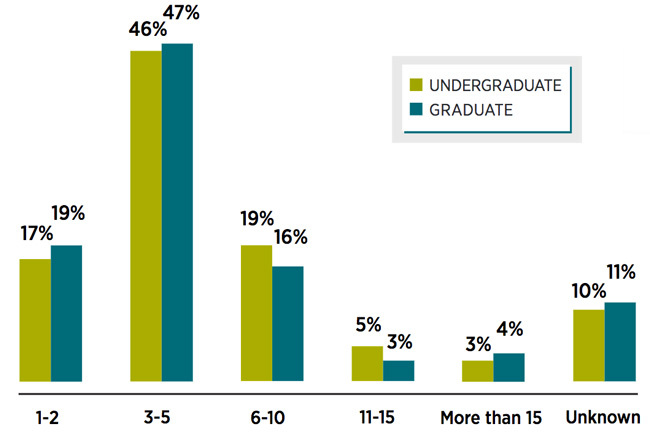 Eduventures found that nearly half of international undergraduate students with an offer of admission from a US college or university did not, in the end, choose to attend a US institution. Of the 47% of applicants who opted not to study in the US, 21% remained in their home countries, 13% choose to study in a third country (that is, neither their home country nor the US), and 10% abandoned their study plans altogether. And among that surprisingly large number of students who opted not to follow through on their plans to study in the US, a significant majority (65%) cited affordability as the main reason. “Even though studying in the US is competitively priced compared to studying internationally in many other countries, international students have many choices, making for a dynamic competitive landscape,” says Eduventures Principal Analyst Kim Reid. The following graphic underscores both the cost and communications challenges that Ms Reid points to in her commentary. It reveals again that affordability is consistently the major barrier for international admitted students. But it also reflects a further significant percentage of applicants in each region who felt that they did not have enough information to follow through on their study plans. This entry was posted in Higher Education, North America, Regions, United States and tagged student mobility, college admissions, USA universities, international enrolments, undergraduate student recruitment.